This post was written by Allison Bream, Talent and Communications Associate at One Acre Fund. One Acre Fund is an agriculture organization that helps East African farmers to grow their own way out of hunger. Learn more at oneacrefund.org. The worst part of Helen Soita’s year began every March. Her previous harvest would be nearly gone, and the next harvest was still months away. Helen would toil for hours in her family’s fields, hoping that this year would be the year she grew enough food to feed her five children. Inevitably, Helen would begin cutting portions, then entire meals. “We would feel so weak because we slept on an empty stomach and then had to go farm,” Helen recalls. Helen’s story is not uncommon. Up to 75 percent of agriculture producers in Africa are women. Collectively, these women spend thousands of hours working in their fields, only to produce meager harvests that are not large enough to feed their families. For example, over 96 percent of economically active women work in agriculture in Rwanda, yet 57 percent of households live below the poverty line. Breaking the cycle of hunger and poverty for women like Helen requires an innovation in agriculture productivity. Women farmers around the world face even greater barriers to increasing their agriculture productivity than their husbands or sons. While many rural farmers have difficulty accessing seed and fertilizer from distant market points, women are especially pressed for time and money. It is also particularly difficult for women to access credit in rural communities, as most do not have a formal title to their primary asset: land. In fact, according to the UN Food and Agriculture Organization, only 10 percent of credit in sub-Saharan Africa is extended to women. Due to prevailing gender norms, many women farmers are less educated than men, having completed only primary school. Finally, although women are responsible for growing a family’s crops, they are largely locked out of markets to sell their produce. The business of selling crops is male-dominated, and women often have difficulty negotiating with traders to obtain a fair price. One Acre Fund empowers women to grow their way out of poverty through providing a “market bundle”: inputs, finance, training, and market facilitation. This market bundle is delivered to over 130,000 smallholder farmers in Kenya, Rwanda, and Burundi, deep in the rural areas where they live. One Acre Fund requires all loan contracts to be signed by the person tending to the fields, meaning that a large percentage of our loan contracts are signed by women. In Western Kenya, for example, women constitute about 60 percent of contract signers. Once these farmers are armed with new inputs and knowledge, they are able to grow more food and use their income to build better homes, open new businesses, buy more land, purchase livestock, and, most often, pay for their children’s education. In this way One Acre Fund serves not only individual farmers, but entire families. As women farmers transform their families, entire communities begin to change, too. One Acre Fund commonly hires its most committed farmers to serve as field officers. As more women farmers sign up for the program, more women have the opportunity to lead their communities as field officers. 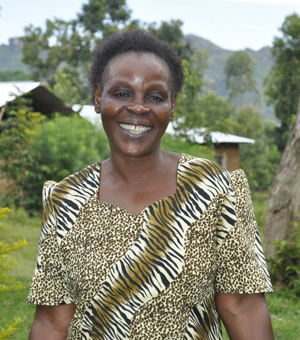 Helen, for example, learned about One Acre Fund from her neighbor and field officer, Phoebe Wanyonyi. High-performing field officers quickly rise through the ranks of the organization. In fact, half of the field directors and assistant field directors in Rwanda are women, and two-thirds of field managers in Burundi are women. Thanks to Helen’s hard work and Phoebe’s extensive training, Helen’s life has turned around. Since her first harvest with One Acre Fund in 2010, she has paid school fees for her children, diversified her crops, and constructed a new house with an iron roof. 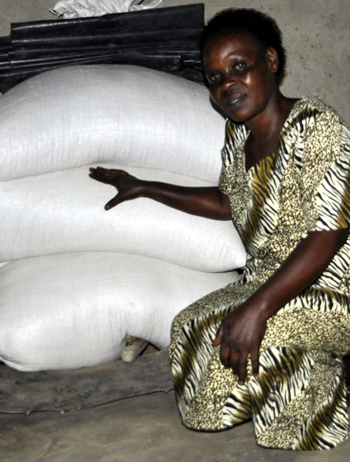 She grew so much surplus maize that she even began selling dried maize to her neighbors. “After joining One Acre Fund, I now have enough food. There is no hunger in our home,” she says.